The young Roman Catholic Priest dressed in leathers and roared around Katowice Town (Poland) on his fast motorbike. Also an accomplished skier, he loved to be the somewhat unconventional daredevil rebel. However the townsfolk respected and admired the priest and after some of the people visited him at home, they were horrified to discover that he had no bed and could not afford to buy one, sleeping every night on a cold uncomfortable floor. To help the priest the townsfolk held a 'whip-around', collecting money to buy him a bed which they quickly raised. He was presented with this unaccustomed luxury of a present and was overwhelmed by the parishioners generosity. The following week he was visited again at home to see how he was getting on. The visitors were surprised when they found him again sleeping on the floor. Sheepishly the priest had to admit that he no longer had the present. 'A young couple have just got married and have not a groszy (Polish money 1 Zloty=100groszy) to their name, only the love of each other. So they have need of a bed more than I and I gave it to them'. The priest had total admiration and gratitude for the gift from the townsfolk but chose to dispense with comfort in knowledge that he was helping others. Even leather clad motorbike riding rebels can have the utmost good intentions, faith in their God and the respect of the community. The Priest had been promoted for his general goodness, and lived under the title Pope John Paul II 265th holder of the office the first being St Peter. 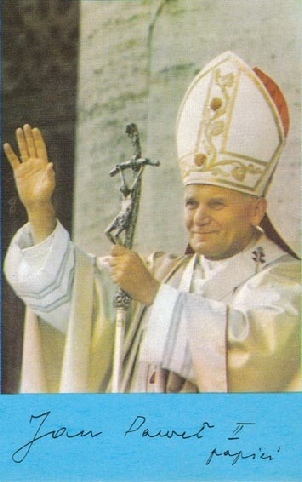 Pope John Paul II picture and autograph. 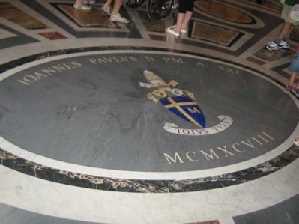 Inside the Vatican Rome, Pope John Paul II shield.